1. Your Squelch needs to be set for Transmit and Receive pl 131.8 to avoid hearing digital conversations on your traditional FM radio. 2. Look at your S-Meter for activity before transmitting as a Digital Conversation may be taking place already. 3. If your radio has a Busy Channel Lock Out – by all means consider activating it. The BCLO feature prevents the transmitter from keying if a signal is detected on your current frequency. Think Belts and Suspenders. 4. Be aware that forcing digital on your Fusion radio prevents you from speaking to traditional analog users and vice versa. 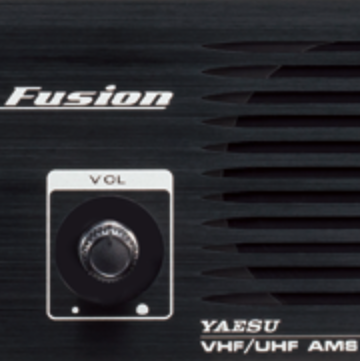 OK, as I mentioned this is the second of the W2ZQ clubs Yaesu System Fusion machines to go on the air. Remember that the 2 meter machine, 146.670, has been running great and has daily activity as well as the Pepper Net @ 2200 hours local time. BTW – They would love to have you check in. So what may be on the horizon for the machines? Well we have a lot of possibilities now that the machines are on solid footings. We recently acquired several hundred feet of high quality semi-rigid feed lines that are well suited for UHF / VHF frequencies, and we also had a amazing donation of 70 feet of Rohn25G from the estate of K3WHP (SK) . Both of these items seem destined to become the new improved – higher home for the 2 meter machine. We can re-purpose the shacks existing tower foundation using either a flat bottom base plate or even consider a tip over to preclude future climbs! Either way the signal will be improved as the key to UHF/VHF repeater performance is elevation! 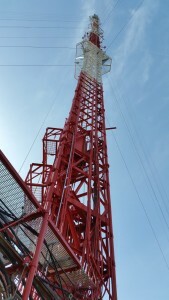 As to coverage reports – upon the activation of the 2 meter machine on March 14th we immediately received positive reports from club members that had been in the fringe areas with the HiPro repeater. This has been our experience with the 442.650 machine atop the CH52 tower. The 440 coverage has been verified as far North as Union NJ 25 miles and South to Deptford Mall 38 miles! This is very close to our theoretical distance to horizon of 70 mile diameter footprint so very few should be grousing! Now of course as with any endeavor we have room for improvement – the duplexors could be re-tuned or the harnesses cleaned / tightened up – one the other hand sometimes it best to leave well enough alone !